It is one thing to have a good database system, but another to think about securing your data. Companies have spent a lot of money, and time, trying to recover from the harm of being hacked, so they don’t experience such situations again. These cyber-crimes have become so rampant, that it is essential for companies to take precautions, and safeguard their data from being accessed by internet fraudsters. When you have an easy-to-guess password, it makes your data very vulnerable. You can’t protect your data with weak passwords. There are software programmes that hackers use to guess passwords. These programmes can quickly bring out common phrases or dictionary words. It is better also to avoid using simple passwords, such as 12345, or letters of the alphabet written in alphabetical order. Throw in a mix of letters, numbers and symbols, that cannot be guessed by hackers, to form your password. Another way to secure your company’s data is to mandate employees to change their passwords on a regular basis. For instance, passwords can be replaced every three months, and if the password isn’t changed, the account should be locked, until the database administrator verifies that the account has not been hacked. Another critical security measure, just like passwords, is data encryption. 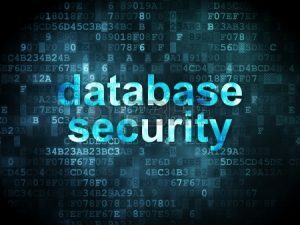 By encrypting your database, it means that if another platform tries to access your data, it will show a set of meaningless numbers and letters. This would make it impossible for the hacker to obtain your information. It is essential that you have a current encryption programme to protect your data from hackers. If you want your database secure, it shouldn’t be available on search engines, and you should also avoid accessing it through a direct link. It is not advisable to have your database visible on your website. It should only be available to the people who need to have access to it. If your database is hidden from the web, it would be almost impossible for hackers to find it. If all users of a database have access to all the permissions, it will make the database vulnerable. To protect it, have the database administrator segment your data, to make it difficult for just anybody to have access to it. In most data management systems, users have different roles. Some users can create and update information in the database, while some can only view the information on the database. It is better to limit the number of people that are allowed to access the database, such as managers and heads of departments. This will make it easy to monitor, if someone has leaked the password, and made the system vulnerable. When you monitor your database, it would be easy to notice when there is unusual activity on the database quickly. By monitoring, you would be able to detect if an unknown IP address, which is not from any of the company’s employees, is trying to access your database. It is also essential to conduct regular audits on your database, to detect accounts that are inactive quickly.